Loading docks areas are always full of activity in warehouses and distribution centers. The dock itself is a recessed inlet in a facility where trucks are loaded and unloaded with products coming in and going out. They are commonly found at manufacturing plants, warehouses and other industrial buildings. Every year injuries and fatalities occur at or around loading docks. Due to the different operations taking place in a warehouse, distribution center or other unloading operation, loading dock environments can be one of the more hazardous areas within a facility. Accidents resulting from trailer creep, employees being hit by forklifts and other powered trucks, slips, trips, falls, unsecured loads, debris on the floor, chemical splashes, forklifts overturning as well as unguarded machinery are all common based on the hazards present around loading docks . It is therefore important to have a systematic safety strategy in place to help reduce the potential of accidents within the loading dock area. 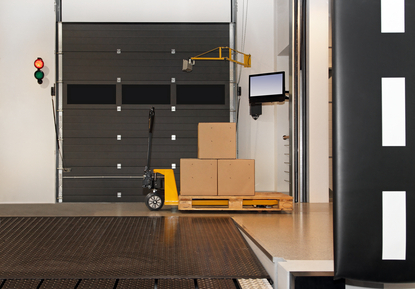 Before implementing a system here are four best practices for loading dock safety. Proper Restraining of the Trailer - Industrial wheel chocks, wheel-based restraints and automated restraint equipment are all common methods available for securing trailers at loading docks. Communicating the Status of the Restraint to Drivers and Forklift Operators – Having a communication system that offers a quick visual read to drivers and your employees will help ensure that everyone operating safely together. Protecting Open Docks – Dock barrier systems and dock shelters can reduce the risks posed by an open dock. Creating a Smooth Transition from Floor to Trailer Bed- The forklift operator enters and exits a trailer via a leveler, and when this happens he or she often experiences a series of jolts and joint shocks several times a day. Over time these shocks lead to chronic back pain or spine injury, along with lost wages and reduced productivity. Employers should look for a leveler that offers as smooth of a transition as possible.